Our standard line of products is comprised of a variety of Integrated X-Ray (IXS) Sources and High Voltage Generators (HVG) with unique features that are designed to meet the needs of OEM businesses for a multitude of applications. Each and every product in our catalog can be customized. VJ X-Ray has the expertise and capabilities to customize all the features and specifications of our products to meet your specific requirements and deliver you the confidence of the perfect solution! 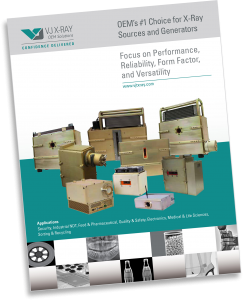 Browse our catalog to learn more about our most requested products that are new and improved with a focus on performance, reliability, form factor, and versatility.